In case there was any doubt as to Kirkcudbright’s contemporary art awareness – here stands the Sixth Plinth in homage to Anthony Gormley, for the duration of Kirkcudbright’s Summer Art Season! My project for the week has been in preparation for an arts and crafts workshop at Drummuir Ice Cream Farm’s (near Dumfries) 21st Birthday celebrations on the 2nd of September. 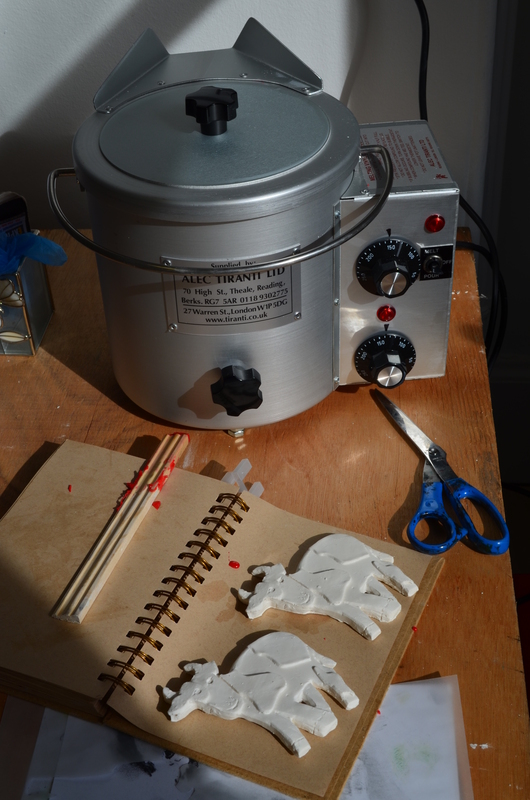 Casting plaster cows, to be painted by any interested children – or so goes the plan at the moment! So it may not be quite high art, but good practice to get back into mould making.. I’ve got 15 so far – so should have them all done in time for the 2nd! On my art trail of the beautiful D&G, this weeks visit was to the Mill on the Fleet exhibition centre, and Denise Zygadlo‘s exhibition Involutus Memet (http://www.millonthefleet.co.uk/index.php/exhibitions/programme/26-denise-zygadlo). Having never been to the space before, it is an attic space of rafters and a nice light. Hidden through a maze of towering, teetering bookshelves – Zygadlo’s exhibition is a haunting, slightly uncanny installation of screen printed photocopies of the body on translucent hangings. There is a beauty in the making of her work, but on closer inspection the subject somewhat unsettling. No pictures sadly, been playing about with my new Diana+ medium format camera, so going to have to wait til they get developed! Starting to get organised and settled in to making work after a month or so’s break since the chaos of Degree Show in Carlisle – may take a couple of weeks for it to feel properly like home, but it’s getting there! Home to my studio for the next 12 months!! This will hopefully be a bit of a progress report, for my new studio space for the 12 months. Situated in Dumfries and Galloway’s artist town of Kirkcudbright, this is a spot for updates on my works progress and explorations into the art-ier side of D&G! Shifting into the world beyond uni, this is a challenge to my practice and an opportunity to develop new work in relation to new surroundings. The picturesque rural nature of D&G leaves plenty of possibility for artists in abundance, and indeed they are – as popular annual events like Spring Fling and the annual Arts Festival suggest. On the way home I went on a hunt for the illusive sculptures at Glenkiln, I’d be honest and say I spent about three-quarters of the time lost, but did manage to bump into a couple of pieces – pictured here (I’m pretty sure anyways) is a Henry Moore, though the title of which I don’t know – did have to chase the cows off it a bit to see and scramble up the hill but quite worth it. However, it was possibly the worst signposted place ever – so will have to go back some other times equipped with various maps and things to try my luck next time.